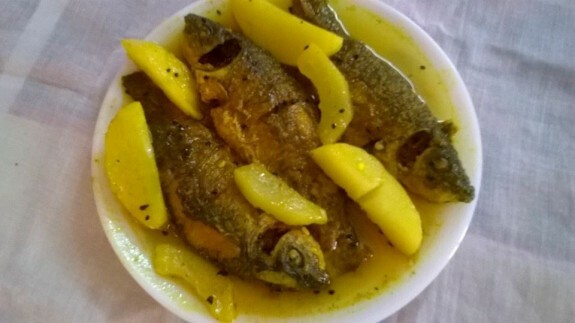 Chara Pona Macher Jhol is Bengali recipe which is very light food and can easily serve to anyone even to the ill person. You can also add green banana, papaya in this Jhol to make it more healthy and tasty too. 1. Marinate the fish pieces with turmeric powder and salt for few minutes. 2. Heat oil in a pan and lightly fry the fishes. Keep it aside. 3. Heat 3 Tbsp oil in another pan and add black cumin seeds. When it crackles, add the potatoes. If you are using Papaya and Green banana, add these with potatoes. 4. Lightly fry them and add turmeric powder and salt. Mix everything well. You can also add 1 green chilli chopped. Add 1-2Tbsp water and cover it. In between stir fry it. 5. When the potatoes are almost cooked, add the rest if the warm water and chopped green chillies. 6. Let it comes to boil. Once boiled, add the fried fishes (Chara Pona Mach) and cook for another 2-3 minutes. 7. Serve it hot with steamed rice.